The bedstraws (see previous blog) belong to the Rubiaceae - a family that embraces a number of climbing / scrambling plants. Another plant from this family is the wild madder (Rubia peregrina). This is a vigorous and evergreen perennial that may be found in hedgerows, and also at coastal locations as it is resistant to wind and salt spray. Its stems have marked ridges / corners (these can be seen in featured photo) consequently these stems are rectangular in cross-section. They often bear numerous prickles; these prickles help them clamber up and over plants / branches in a hedgerow, not dis-similar to the bedstraws. 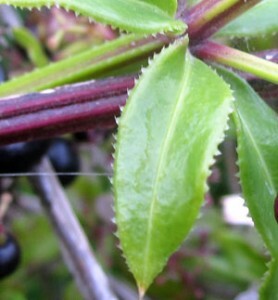 The leaves of the wild madder are quite distinctive being shiny and a bright green; like the stems they bear numerous prickles (see featured image above). The leaves occurs in whorls of four to six. 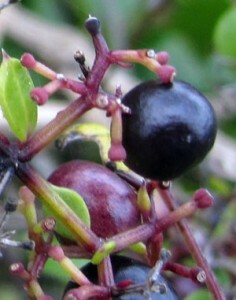 In August, wild madder will form small, inconspicous flowers which if pollinated and fertilised will form distinctive pea-sized black berries (see photo). The madders and bedstraws have been used over the centuries in the making of various dyes. The common madder (Rubia tinctorum) was grown and used in the making of a range of red dyes. Its long roots (up to one meter in length) were particularly valuable as a source of the dye(s): rose madder and turkey red. When freshly harvested and cut, the centre of the root is yellow but soon turns red in the air. The extract was combined with acids, alum and iron alum to give a range of colours from pink, through to red, brown and violet. These dyes were used with a range of materials - leather, wool, cotton and silk. The use of these natural dyes has a long history in this country and abroad - remains of madder (and woad) was excavated with Viking material at York. Towards the end of the Nineteenth Century, the chemical alizarin red (that was the basis of the dyes) was manufactured industrially ; the cultivation of the madder died out - more or less from the time of the industrial manufacture of the dye. Holly, predicting the weather ? Leaf variation – Holly (and Ivy).